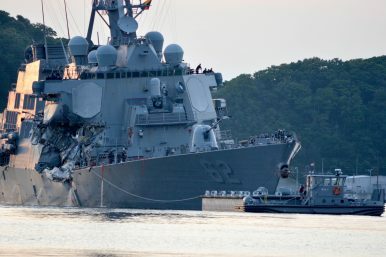 Last week the U.S. House of Representatives held a hearing on the recent collisions of two Japan-based U.S. warships, the USS Fitzgerald and USS John S. McCain, with merchant vessels that killed 17 sailors. The hearing cast new attention on long-standing readiness issues among ships in the forward-deployed Seventh Fleet and came on the heels of more recent revelations about certification practices suggesting at least a third of them operate under expired training. While the U.S. Seventh Fleet undoubtedly faces great challenges, most are not new, just newly in the public eye, and damning numbers should not be over-interpreted, nor the fleet under-estimated. In 2015, the Government Accountability Office found that 7 percent of Japan-based ships were operating with expired training certifications. The GAO attributed this to the Seventh Fleet’s much higher operational tempo, which keeps its ships operating at-sea much longer than U.S.-based ships. As a result, ships in Japan do not follow the normal dedicated cycle of training, followed by a single, extended deployment, that the rest of the U.S. fleet does. Instead, training and maintenance in Japan are conducted “on the margins,” which effectively means it is squeezed in wherever it can in between ships’ real-world operational commitments around the Western Pacific. The revelations come as some speculate that U.S. Navy’s mishaps in the Pacific undermine the United States’ Asian allies’ faith in its ability to underwrite security in the region. Perhaps signaling its eagerness to fill the void – even a perceived one – some of China’s English-language press responded to the two collisions with a series of political cartoons mocking the U.S. Navy’s competence (and showing no regard for the tragic loss of life). But despite the recent mishaps and tragedies, it’s premature to infer that these mishaps mean the U.S. warships based in Japan are less proficient than their U.S.-based counterparts, who enjoy more standardized pre-deployment training. The Seventh Fleet’s lapsed training certifications are ultimately administrative determinations, and don’t necessarily mean its ships do not know how to operate effectively. Futhermore, it is difficult to compare the mishap rates of U.S. and Japan-based ships because they operate in very different environments and spend much different amounts of time at-sea. The admirals testifying before Congress explained that the high-rate of expired training certifications did not necessarily indicate that the ships were unable to safely operate, and that more specific information on why they lapsed would be required to judge whether it had an impact on the Fitzgerald or McCain. Ship’s training certifications are dependent on a vast array of administrative, personnel, and finally performance-based criteria. An expired certification in seamanship, for example, does not mean that the ship’s crew cannot safely operate the ship. The ships in Japan have very busy schedules and the trainers that perform certifications there are severely under-staffed, according to Rear Admiral Ronald Boxall, who testified alongside Admiral Moran. This means it is often difficult for ships to schedule some relatively esoteric demonstration events, such as towing another warship (something normally done by dedicated tugs) or mooring to a specialized buoy instead of a pier. Being unable to demonstrate events like these would mean a ship’s certification would lapse, but they are so rarely required of a warship that it doesn’t matter in practice. Even if U.S. and Japan-based ships were assumed to have identical proficiency, the Japan-based ships would still be expected to experience more shiphandling mishaps because they are exposed to far more hazardous at-sea conditions, and far more often, than U.S.-based ships. This is because Japan-based ships spend more time at-sea than U.S.-based ships – nearly two-thirds more, according to the GAO – and so have much greater exposure to risk of mishap. Furthermore, a greater share of Japan-based ships’ time at-sea is spent in far perilous, high-traffic areas compared to the normal training and operating areas of U.S.-based ships. U.S.-based ships conduct most of their pre-deployment training off the coasts of Hawaii, or the east or west coasts of the continental United States, in low-traffic training areas away from major sea-lanes. When they do deploy, they transit for weeks across relatively low-traffic parts of the Pacific or Atlantic oceans to get to their operating areas. Japan-based ships, on the other hand, perform what training they do get in the always-busy waters around Japan. Then when they deploy, it is almost always within the Western Pacific, home to many of the densest shipping lanes in the world. 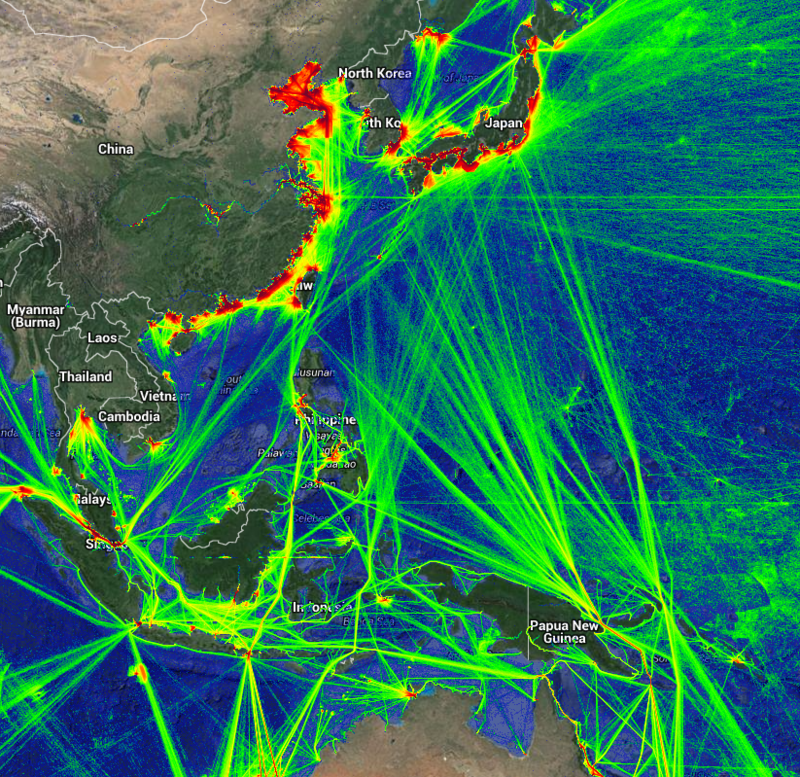 In addition to shipping lanes, the western Pacific is also home to vast fishing fleets that rarely transmit location data or answer on the radio if called up. The U.S. Navy has suffered a series of alternately embarrassing and tragic mishaps in the Pacific this year, and its Japan-based ships are the busiest in the fleet, squeezing the time available for training and maintenance. But while the Seventh Fleet may have taken a public blow to its operating credibility, its ships are still the most experienced in the U.S. Navy, operating its most arduous waters, and should not be underestimated.